See at night what happens after the public leaves! Photos taken every 10 secs. I got a few auto flashing RGB light emitting diodes and discovered that an audio amplifier can be used to hear the PWM frequency as the LED flashes. So what do they sound like? Download this file. 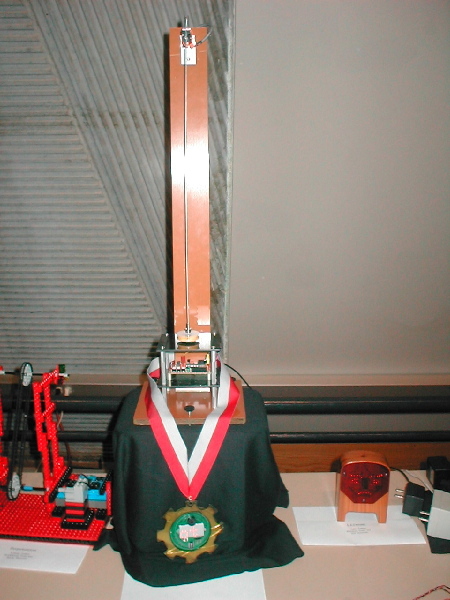 This got me thinking of a great entry for the Musical Art Bot competition at Robolympics 2005. By connecting a resistor, such as 47 ohms on the negative leg of the flashing led, PWM modulations can be extracted. Use a .1 microfarad capacitor to AC couple to a amplifier. I used a pair of amplified speakers such as the type one would connect to your PC. 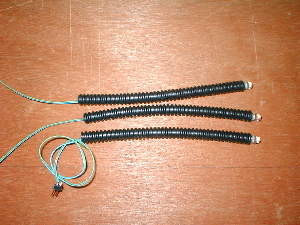 You can connect the led up to 5 volts directly, the resistor is only necessary to generate the audio signals. I decided to have some fun with the project by using a Picaxe microprocessor to control the turn on and off of each led. 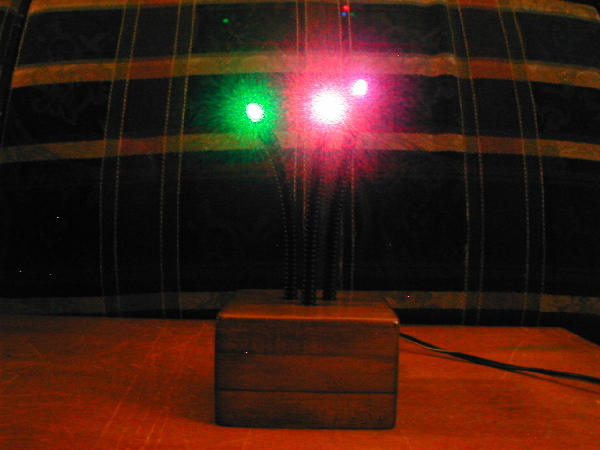 Now my leds turned into a trio named the "Singing RGB's"
I chose the Picaxe because of the ease of programming in basic. You can use a microchip 12F629 or 12F675 programmed with your own compilier. The right and left leds feed into the right and left audio channels. 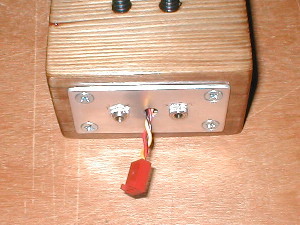 The middle "singer" adds to both channels of the amplifier. A small mosfet, such as a VN10L or 2N7000 switches the led, under control of the microprocessor. You can also use a 2N4401, 2N3904 or 2N2222 or just about any general purpose NPN transistor to switch the led. Place the RGB's in your window sill at night and drive your neighbors nuts with all the flashing lights. I cut up squares of wood for a neat looking stage to hold the electronics inside. 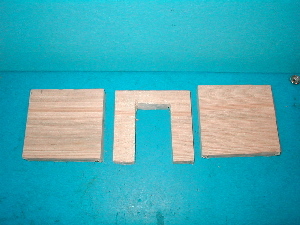 Cut up 3 squares of 3" by 3" by 1" wood. Cut a section out in the center piece for the electronics. 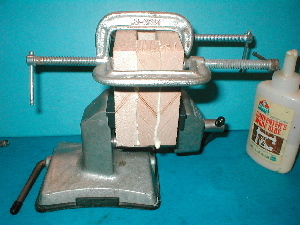 Glue and stack the squares. 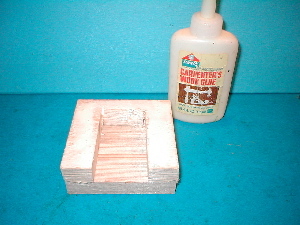 After sanding, staining and applying a finish on the block, drill 3 holes on top for supporting the leds. Mount the leds inside a LEGO tube or something similar. Polished copper or brass tubing would be nice. Place the electronics inside. I wired the circuit on some Radio Shack perf board. 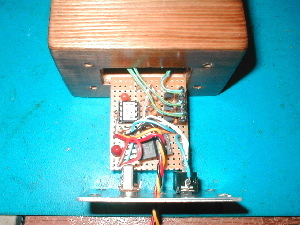 At the back, attach a small plate with jacks for power, audio and the Picaxe programming port. You can try more than just three leds or just use a single led. You can use use non-flashing leds and write your own PWM routines. Add a CDS light sensitive resistor and use the ADC on the microprocessor to monitor the light levels. The leds can turn on automatically when it becomes dark. Add a microphone and use sound to trigger the leds to come on. Add a PIR sensor or a Sharp GP2D12 sensor to trigger operation when people walk by. I devised a method using a PIC microprocessor to detect the swing and give it a kick automatically at just the right time to keep it going. The pendulum bob has a magnet at the end and on each swing the magnet crosses a coil. If a magnet in motion passes over a coil, a voltage is generated. The voltage rise can be detected using the PIC's on-board voltage comparator. After detection, power can be applied to the coil as a pulse, to draw the magnet, along with the pendulum bob closer to the coil. Pulling in the bob quickly, restores energy loss during each swing. The amplitude of the swing can be adjusted by setting how long the pulse lasts. 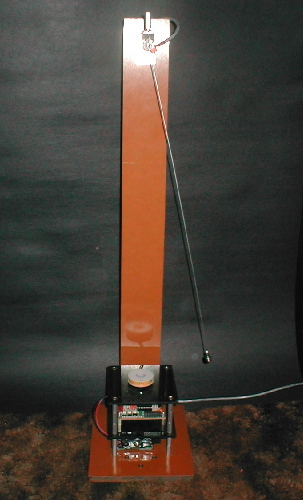 Since the period of the swing is dependent on the length of the pendulum and each swing triggers a pulse, the PIC pendulum driver will automatically adjust on just about any pendulum length. Swing amplitude is controlled by two buttons on the controller and adjust kick duration from 1 to 20 milliseconds. A third button and LED is used to indicate kick time and save setting into data memory. The medals presented at the Robogames were fantastic! Many Thanks to Dave Winchell, Parallax, Serge Dureix and David Calkins, president of the Robotics Society of America . Each of the medals have a scrolling LED display programmed with the name of the entry. They even play robotic sounds when starting up! 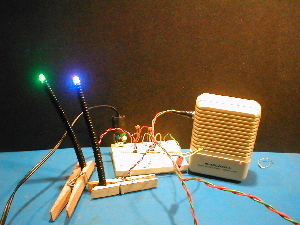 These are green surface mount leds mounted on enamaled wire stakes and driven by a Picaxe microcontroller. The flashing is made to simulate the behavour of real fireflies. Connected to the leds is a special board I invented for experimenting with the Picaxe. After I developed a circuit and program, I moved it over to a #276-148 perf board from Radio Shack. I am currently developing a PC board. If anyone is interested, send me an email. First experiments and program development. Put your "fireflys" in a jar. You can listen to the PWM from the flashing leds if you use capacitors and resistors to bring the signals to a set of speakers. Computer speakers work great for this. Here is a schematic of how to do it. Noureddine Benabadji for EDN article about driving many leds with a minimum of I/O lines. Keso's version of "Jar of Fireflies" , an Instructable. Chuck did some changes to the code for this version. Programmable Picaxe brained critters that interact with each other and with you. The picaxe is a low-cost microcontroller that can be programmed with a free basic language complier from Revolution Education. I decided to make a few PC boards to test out it's functions in the form of a "Bug" which I call "PICbugs". 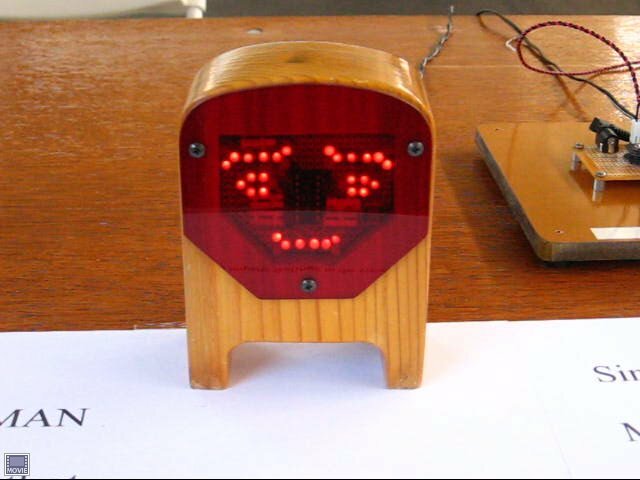 The PICbug has leds to flash, a beeper, IR transmitting LED and a IR reciever. Programming is by a serial link cable that plugs into the board. Presently I am doing experiments with the bugs talking to each other with the onboard IR hardware. 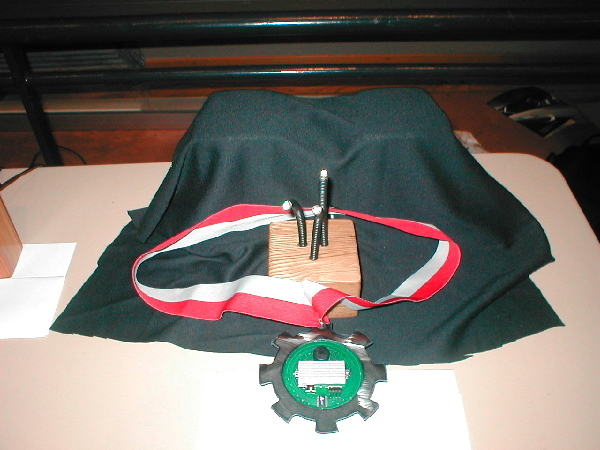 These little bugs won bronze during the 2007 Robogames artbot competitions. 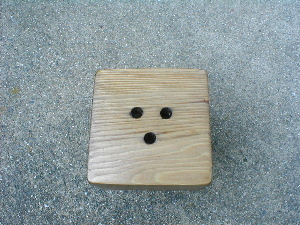 This object was something I made many years ago. Emotion AL displays it's many moods by changing the patterns of the leds. His moods are passed on and felt by anyone who views him.